Can’t get enough of Star Trek: The Future Begins at the cinemas? 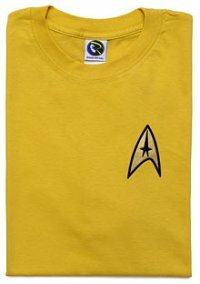 Why not display your allegiance to the sci-fi series with the Star Trek TOS Tunic Tees? Here’s a hilarious description of the product from the enterprising (pun not intended) folks at ThinkGeek. Each department was color-coded with different tunics. Gold for Command, red for Ops, and blue for Sciences. The Captain, always a giant swinging ego onboard ship, wore his own color – green, with the insignia worn swaggeringly low on his hip. When on duty, every crew member wore their uniforms, but what did they wear when off-duty? Pretty much, the same shirts, just short-sleeves. Sometimes, though, they just wore them because they are so gosh-darned comfortable! You will be able to choose from a quartet of officially licensed shirts, where they will come in command-gold, ops-red, sciences-blue, and captain-green colors. All shirts will feature a different “flex and flock” insignia, depending on the department. Depending on the size of your choice, you will have to fork out anywhere from $24.99 to $26.99 a pop.